In road cycling terms, Australia’s climate effort is dropping off the back of the peloton. More than that we are now spreading tacks on the road up front. Abbott, with his soul-mate from “Canadia” Stephen Harper, is proposing to build an alliance of conservative world leaders to block what he calls job-killing carbon pricing. Dr Robyn Eckersley of Melbourne University who has been conducting research on climate change leadership finds that this would be “a very retrograde step at a very crucial time in international climate negotiations”. She also finds that he may struggle to find partners. The UK under David Cameron are unlikely to join. New Zealand has a conservative leader, and a carbon pricing scheme. Perhaps he’ll enlist the support of Saudi Arabia, who Eckersley sees as the biggest spoiler of all. 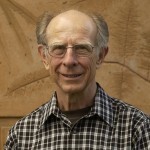 Eckersley points out that British Columbia, Quebec and California, one of the biggest economies in the world, have carbon pricing. China is launching seven provincial pilot emissions trading systems. Abbott claims that the world is moving away from carbon pricing to ‘direct action’ type policies. Sophie Vorrath at RenewEconomy cites the World Bank as saying that carbon pricing is here to stay with more than 60 carbon pricing systems currently in operation or development globally. Abbott doesn’t realise that the economy exists within the environment. 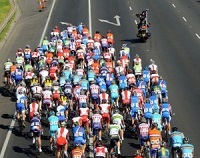 There is Australia at the back of the peloton. If everyone did what we are doing the world would be toast, and with no economy to speak of. 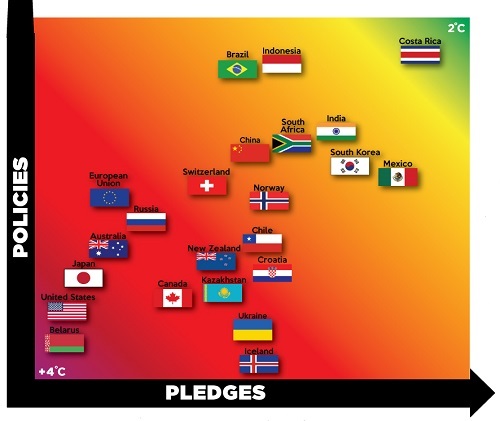 Climate Tracker currently sees Australia’s effort as “inadequate” and getting worse. With our performance the world would be heading towards 600 ppm and 4°C. Abbott’s Canadian performance was no doubt intended to be one in the eye for Barack Obama, who Abbott sees next. The signal is that Obama would be wasting his time persuading Abbott to put climate change on the G20 agenda. Laura Tingle, talking to Phillip Adams, opined that addressing climate change in the G20 would be a precedent since the G20 so far has restricted itself to economics. She also said that there was nothing doing in terms of international co-operation, and they were all off doing there own thing. The timetable is that leaders will meet with the UN Director General in New York on 23 September 2014 with a show and tell of their thinking on contributions, and no doubt receive some jaw-boning from him in return. There will be more talking at the 20th COP in Lima from 1-12 December 2014, where a draft new climate agreement will be tabled. Then in April 2015 countries will seriously start putting their “contributions” (rather than “commitments”) on the table “without prejudice to the legal nature of the contributions”. These “contributions” might be targets but could be other efforts to keep emissions down. All this is aimed to get a legally binding agreement which reflects the “common but differentiated responsibility” of each state to be concluded at the Paris COP at the end of 2015 – for implementation in 2020 when the Kyoto Protocol officially expires. So the leaders meet in September, but then not again before the deal is sealed in Paris in December 2015. In Lima I believe only the ministers will attend, noting that we did not bother to send a minister to Warsaw. A new climate agreement is mainstream in policy and planning for the economy. In spreading tacks on the road and trivialising the issue of climate change, Abbott and his government have form. In opposition in 2012 they would not grant Greg Combet a pair to attend the Rio+20 conference. In Warsaw, without a minister (who would have been Julie Bishop, since Greg Hunt is not allowed to conduct international negotiations) the Australian delegation was notorious, earning four “Fossil of the Day” awards and the overall “Colossal Fossil” for the meeting. Civil society groups like Greenpeace, WWF and Friends of the Earth, took the unprecedented step of simply walking out with a day still to go, muttering “Australia” as they went. Being serious about climate change, the last thing Barack Obama would need is that kind of leadership at the G20.